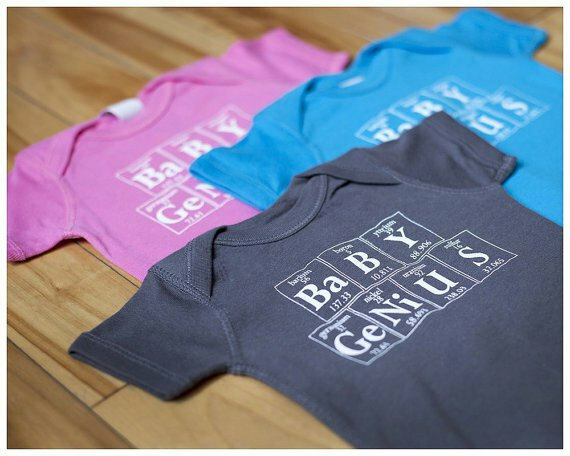 More than a year ago I expressed my love for the Baby Genius onesies by Periodically Inspired in one of my Geeky Find Friday posts. When your husband is a PhD chemist and you took chemistry for years what seems like forever back in college, you grow to have a certain fondness for the Periodic Table of the Elements and all its "this-stuff-makes-up-everything-in-existence" wonder. When I saw that Courtney of Periodically Inspired began making toddler genius tees I knew there was one special geeky toddler in my life who absolutely needed to sport one...NOW. Side note - yes, that's a binky in her mouth. I temporarily gave up. The element symbols above, as well as the element names, atomic numbers, and standard atomic weights are screen printed in their own little mini-Periodic Table on Jersey Knit - 100% combed ringspun cotton right next door from us (in Rhode Island). Okay you can stop taking pictures of me now, Mom. I'm too smart for this. Periodically Inspired debuted with Baby Genius baby onesies in the late summer of 2010. Since then, I've brought in about 6-7 new designs for youth and adults. I've been working hard to grow the PI brand and I've been meeting some great people along the way! Melissa of Growing Up Geeky is one of those people. She's been a great PI fan and recently outfitted little Carina in a Genius toddler tee. Thank you, Melissa! Check out Periodically Inspired on Etsy and on Facebook! And see retail locations and upcoming events here! Since it's back-to-school time, Courtney is celebrating with a 35% off discount! 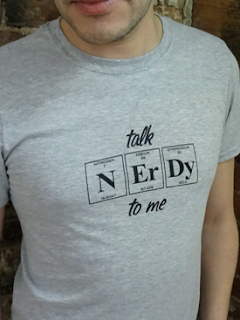 Just enter code WELCOMEBACKGEEKS at checkout. Courtney is offering one of my readers an item of their choice from her shop! This is a Rafflecopter giveaway. Click "Read More" below and then follow the instructions on the widget. Make sure to click "Enter!" after you complete each entry. All currents count! The giveaway is open worldwide and ends at 11:59 PM EST on Thursday, August 23rd. 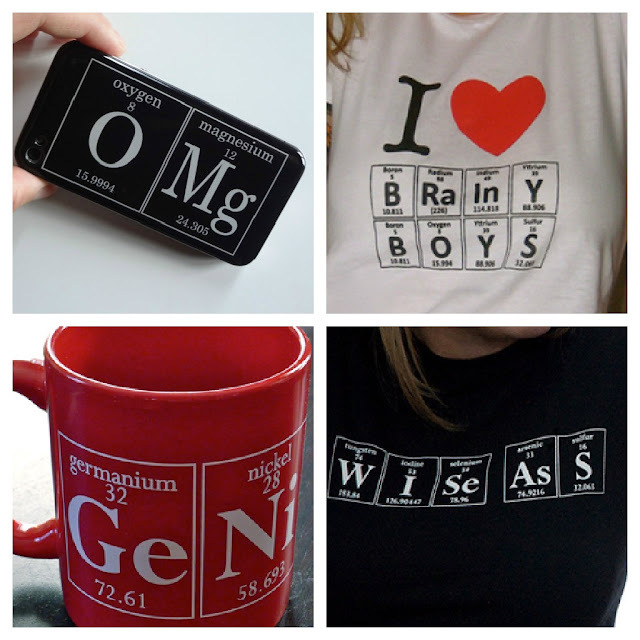 The first entry is mandatory - Visit Periodically Inspired and leave me a comment telling me which item you would choose! Once you complete this entry, the widget will give you the option of completing the rest. Complete more steps for more chances to win!